Sous vide bacon is cooked overnight and up to 24 hours and will give you the best bacon you have ever eaten. Cooking bacon with the sous vide method will allow the bacon maintain all the flavor, meatiness and juiciness that we love in bacon. New to sous vide? I explain in simple terms everything I know about sous vide cooking. I could use this bacon in my deep dish quiche or in bacon cheddar breakfast cups, or before you crips the bacon wrap it around tots and make bacon tater top bombs. What is sous vide bacon. Sous vide loosely translates to ‘under vacum’. Sous vide bacon is bacon that has been cooked in a bag under the vacum of a precision temperature controlled water bath. The extended time and precise temperature of the sous vide makes the best tasting bacon. Sous vide bacon is meaty, juicy, flavorful and tender. Can sous vide bacon be frozen? Sous vide bacon can be made ahead and then frozen. Cook the bacon to your desired time and temperature, cool, separate and then freeze. Thaw the bacon and sear to bring the bacon to your desired crispness. 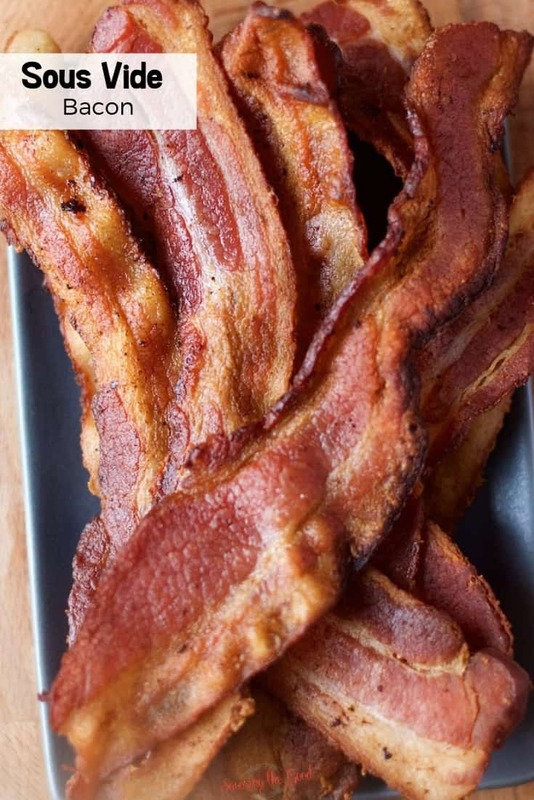 How is sous vide bacon better than pan fried bacon? 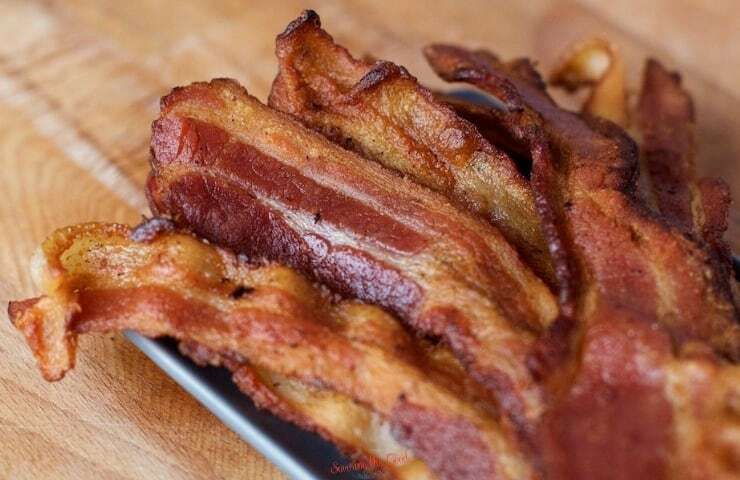 Sous vide bacon is better than pan fried bacon because the sous vide bacon is meaty, crips, juicy and tender. The fat is rendered out of the bacon BUT it is partially cooked IN that fat without the moisture evaporating. The fibers of the meat is cooked slowly and at a specific temperature ensuring that are cooked flat. I know that when I pan fry bacon I am always fighting to keep the bacon from curling up. When the bacon curls up, I am not able to get each piece to cook the way I want it cooked. By cooking bacon sous vide, I am able to get crisp, not burnt bacon. As my daughter said, mom! It is meaty… not crumply! Can I sous vide the bacon in the bag I bought it in? Some people will say yes to sous vide the bacon in the bag you bought it in. I say no. A lot of bacon comes in ‘easy open’ bags. I can’t trust those seals. If the bacon comes in a traditional packaging, I know that there is usually a paper/cardboard information in the package. I am also pretty sure that paper is not meant to be cooked. These are just a few reasons I transfer my bacon to either a zip top bag or a seal an vac bag. It is up to you as it of you want to sous vide your bacon in the original packaging, this is just my advise and opinion. Can I sous vide regular cut bacon? Regular cut bacon can be cooked sous vide. Just be sure to separate the pieces so they don’t stick together. I find that thick cut bacon is meatier and better suited for sous vide. Transfer thick cut bacon to a zip top bag or vacum and seal bag. Set sous vide water bath to 147F /63.8C. Cover the sous vice container to reduce evaporation. Remove from the water and cool bacon to the touch. Separate the bacon strips to avoid them from sticking together as the cool completely. Snip a corner off the bag while the bacon is still warm and allow the fat to drain. Save the bacon fat for other cooking. Cook multiple package of bacon at once. Heat a cast iron, or heavy bottom pan over medium high heat for 5 minutes. Pan may smoke. Sear the bacon for 2-3 minutes per side or until it reaches your desired crispness. Remove from the pan and place on a paper towel lined plate. Sous vide bacon is cooked overnight and up to 24 hours and will give you the best bacon you have ever eaten. Cooking bacon with the sous vide method will allow the bacon maintain all the flavor, meatiness and juiciness that we love in bacon. This is such a wonderful recipe to keep on hand. I had no idea how to cook bacon this way – thank you. Thanks for the recipe. This is changing how I make and eat bacon.